It's pretty rare that I hear about a kid who doesn't like Sesame Street. When it does happen, however, I wonder how the parents are going to deal with having a future serial killer on their hands. Seriously, how could *anyone* not like Elmo, Big Bird, Oscar the Grouch, Snufalufagus, and the rest of the gang? 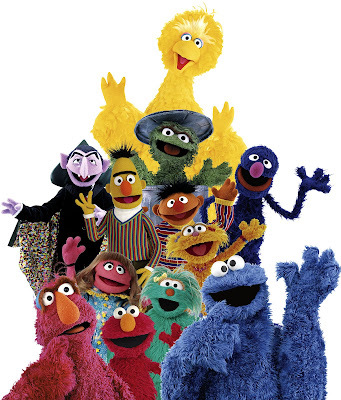 Fortunately, Sesame Street still has a ton of fans because the PBS program celebrates its 40th birthday today. Of course, we all know that the muppets were the creation of Jim Henson. But the show was the brainchild of Joan Ganz Cooney, who wanted to study how the media could prepare children, especially those from inner-city, low income households, for school. Cooney wanted to create a program that would have a lasting affect on those who watched it for years to come. I think we can safely say she accomplished her goal. I can still remember numerous skits, songs ("Rubber Duckie", "C Is For Cookie", "I Love Trash"), and celebrity appearances. Speaking of the latter, there are probably few celebs who haven't appeared on the show - even Robert De Niro, James Gandolfini, Ice-T, and Peter Jennings were all guests. My favorite character was Big Bird, even though -let's face it - he could be very annoying and naive at times. Least favorite? Perhaps Oscar the Grouch, because I never understood what he was so grouchy about! Never a show to miss the boat on modern pop culture, Sesame Street recently did a silly parody of Mad Men, featuring Guy Smiley as Don Draper. Here's to the next forty years. I was a Sesame Street kid too! The Mad Men clip is so cute! You know, my wife didn't like Sesame Street growing up. I love her to bits... but this is one aspect of her character that's a little odd. How can you not like Sesame Street? Whatever Happened to Great Instrumental Music?